You are here: Home / Wild Blog / Wild Opinion / Irish farmers, you need representatives with more “cop on”! Irish farmers, you need representatives with more “cop on”! 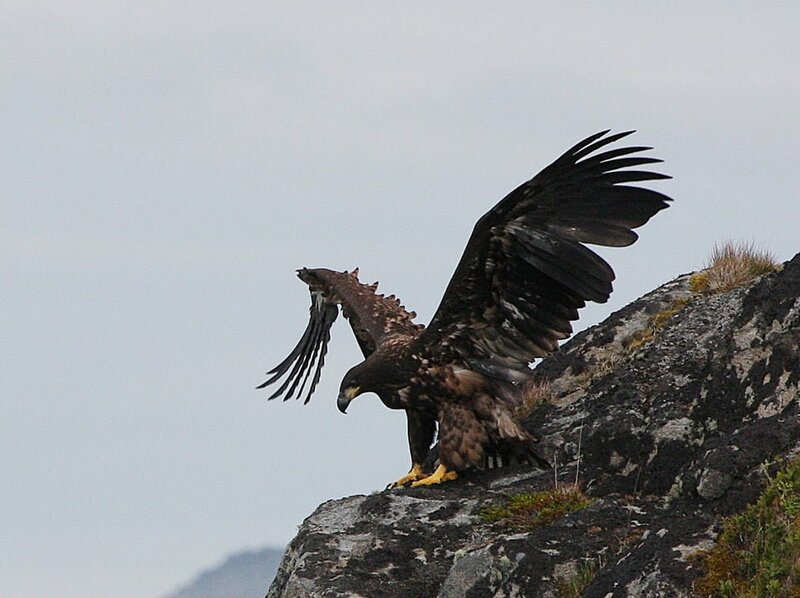 A young white-tailed eagle flexes its wings on the Norwegian coast — a site that may soon be replicated here in Ireland. Irish farmers are intelligent people… and many of the farmers I meet on a day-to-day basis have at least some understanding of the wildlife they share their land with. I live in a farming community, and much of the wildlife I encounter every day is living on in and around farmland. I can’t in good conscience pretend that most farmers are benevolent to wildlife… they patently aren’t. But I would say that the majority are largely neutral: they don’t go out of their way to help wildlife… its true… but neither do they go out of their way to harm it. So it must be incredibly frustrating for the average farmer when an Irish Farmers Association (IFA) representative comes out with yet another obtuse and ill-informed tirade about a wildlife issue in the media. These ludicrous rants do nothing but make the farming community as a whole seem, to put it bluntly, foolish and self serving. The latest ridiculous uttering comes from IFA Kerry spokesman, James McCarthy on the back of today’s news that two White-Tailed Eagle chicks have successfully hatched in Ireland for the first time in over 100 years. Not only is this guff perpetuating the nonsensical and completely unfounded notion that eagles kill healthy lambs, but the whole whining “it’s not fair on the farmer” stance is unlikely to win farmers much sympathy. To be honest it taints the public perception of the entire industry. Even the most cursory look at the available evidence shows that the notion of eagles decimating farmers’ lamb stock is ludicrous. It simply doesn’t happen. In Norway, the source of the fledgling eagles for the Irish reintroduction project, studies of eagle predation spanning more than 35 years have failed to unearth a single incidence of White-tailed Eagle predation on lambs or other livestock. White-tailed Eagles simply are not causing problems for sheep farmers in Norway, and there’s absolutely no evidence to suggest they’d do so here in Ireland, let alone become the scourge the IFA would have us all believe. It’s just another in a long string of unfortunate stances by farming spokespeople who should really know better, and does more harm than good to the credibility of the farming community as a whole. I know if I was a farmer I’d certainly be demanding more from my industry representatives. the farmers do not bother themselves to study or read more about the eagles. I they bothered to read about studies done in Norway they may have an inkling. Ignorance is bliss is it not!!! great article and well said. what a load of gibberish that eagles are a risk to live stock. they hunt fish birds and small mammals, which will probably see the fishermen shooting them as they have done seals. but’s that another story. i cannot for the life of me fathom peoples intent on destroying their own habitat and natural world. i’m sure many farmers are wild life enthusiasts and supporters, but we know many are not. there should be law to enforce all large scale landowners to protect the wildlife that depends on the land they own. Hi JB… and thanks for taking the time to comment. The term “nut” is used in the “enthusiast” sense, rather than the “nut-case” sense… but I take your point. That said, the facts are the facts… and the comments from the IFA are simply scaremongering. They are in no way helpful either to the eagles, or to the farming community. This is an interesting read which basically says that Sea eagles do take lambs and sometimes live lambs. Interesting read Craig… thanks for the link. Hadn’t seen this before. Findings still show that impact on sheep farming from eagles practically negligible, and that most lambs eaten were scavenged… the report also suggests that those lambs that were killed by eagles likely to be “unviable” / weak lambs that would not have survived anyway. On balance it supports the conclusion that white tailed eagles aren’t really a problem for livestock farmers. Nice article. Unfortunately I think the problem extends beyond the spokesperson in that, while he might be highly uninformed, you never seem to hear anyone from the farming community refute what their spokesman says, which strongly suggests they endorse it.